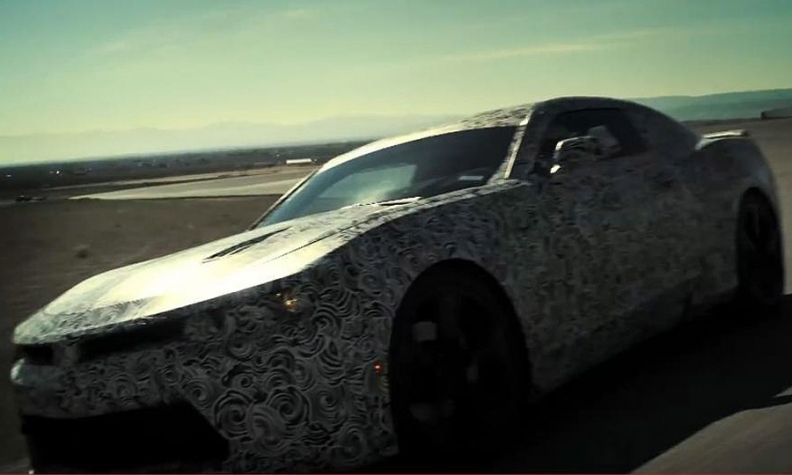 A teaser image of the camouflaged Camaro released by Chevrolet earlier this year. DETROIT (Bloomberg) -- Forget about competing for airtime at an auto show. For the much-anticipated Chevrolet Camaro reveal this Saturday, General Motors is taking the car straight to the public at an outdoor unveiling in Detroit. GM has let 1,000 people register to slip under a tent on Belle Isle in the Detroit River to be among the first to see the sixth generation of the sports coupe. Beyond the hype, the Camaro is an important car for GM. When the automaker brought the name back after a seven-year hiatus in 2009, it took one year to overtake Ford Motor Co.’s Mustang in the “pony car” market, doing so by luring nostalgic baby boomers and young people alike. Ford would debate which car is more iconic, but the Camaro has been the top seller for the past five years. Mustang has the lead so far this year as GM phases out the current car in preparation for building the new model. The Camaro is a solid money maker and also lures buyers -- even younger adults -- into Chevy showrooms, where GM is still trying to prove that it can make desirable passenger cars to sell alongside its popular pickups and sport utility vehicles. While the Camaro has been a success, it almost didn’t happen. In 2008, as GM was in a full-blown financial crisis and sliding toward bankruptcy, management thought about killing the Camaro before the automaker even brought the coupe back to life. It ended production in 2002 after a 35-year run. The only thing that saved it was that the car was far enough along that ditching it wouldn’t have saved much money, Al Oppenheiser, chief engineer for the car, said in a January interview. GM had already invested in the big stamping dies that press out the car’s sporty body panels, he said. But with gasoline selling for about $4 a gallon, GM wondered if a sports car was worth pursuing, Oppenheiser said. “Had we not been so far along on development, Camaro might have been canceled,” he said. Fast forward to this weekend, and GM can brag that the nearly killed fifth-generation Camaro has sold 500,000 copies since 2009. The company has already put out teasers saying the new car will be much improved, especially when it comes to the driving performance. It’s 200 pounds lighter, thanks to some aluminum parts, and more aerodynamic, too, GM said on its website. Sports car fans will like the new Camaro’s design, which more closely resembles the beloved 1969 vintage of the car, said Karl Brauer, senior analyst with Kelley Blue Book, which tracks auto pricing and sales trends. Brauer saw the car in an exclusive event held by Chevy. GM first launched the Camaro in 1967 as a rival to the popular Mustang. It was a strong seller for many years but struggled in the 1990s. By 2001, sales in the U.S. weren’t even 40,000 a year, less than a fourth of Mustang’s business. GM stopped production of the Camaro and its sister car, the Pontiac Firebird, in 2002. Since Pontiac went away in GM’s 2009 bankruptcy, the Camaro is GM’s lone pony. The car has been a fixture in pop culture for several generations. In the popular Transformers movie series, a Camaro was used as the basis for the character Bumblebee. Bruce Springsteen refers to the car in the 1978 tune “Racing in the Street” and in the ’80s, punk band The Dead Milkmen barked about driving through the neighbors yard in the tune “Bitchin’ Camaro,” to name a few. When it reaches dealerships in the fourth quarter of this year, the new car will brag better driving performance. It was engineered using the same underpinnings at the Cadillac ATS compact luxury car. The new Camaro is a light car that’s fun to drive and promises better handling than the outgoing version, Brauer said. Even with some Cadillac hardware, 70 percent of the parts are unique to the Camaro, Chevy said in a statement. The new car is more purpose-built to be a sports car, while the current model was built on the underpinnings of a sedan, Brauer said. The new Camaro will be offered with a 6.2-liter V-8 engine. The V-8 in the current car delivers 426 horsepower. Its muscle heritage makes the car a popular model with baby boomers, who remember the ’60s and ’70s Camaros of their youth. Millennials also respect the car, said Alexander Edwards, managing director of Strategic Vision Inc., a marketing research firm in San Diego.